IMPORTANT NOTE: Effective August 31, 2018, the Copy Center at the Miller School of Medicine Campus will be closed. The Department of Managed Print Services has coordinated with Ricoh to continue providing copy and print services on an "as requested" basis. 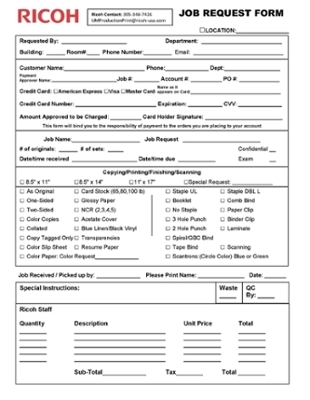 Departments can pay for print/copy jobs via Purchase Order or the University's Procurement Card (P-Card). 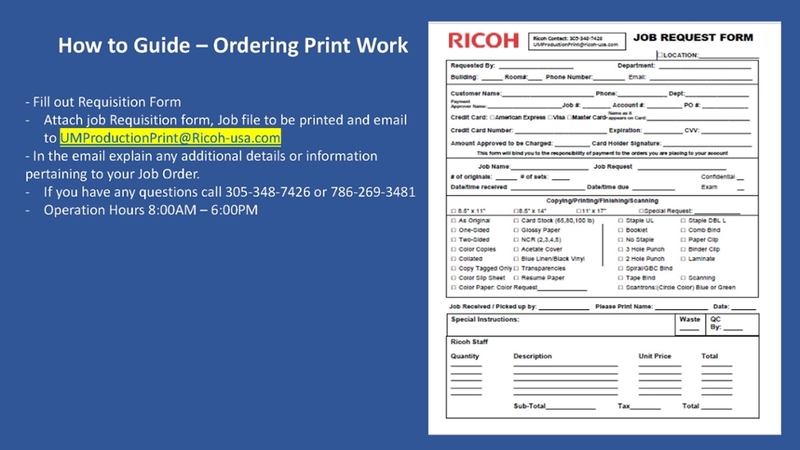 Please call 305-348-7426 or email UMProductionPrint@Ricoh-usa.com, to arrange the pick-up and delivery of print work by Ricoh. Most services are delivered within three working days, with faster turnaround available for an additional cost. Accepted forms of payment are: Interdepartmental Requisition (IDR), checks, cash or credit cards. Printing services include: large format poster printing, mounting on foam board, color laser prints up to 12"x18”, professional photo printing, thermal and spiral binding, lamination, and more.